The Society for Sustainable Business (SSB) was started as a way of bringing together multi-disciplinary professionals, academics and people in business and government who wanted to exchange ideas, learn more, and provide leadership towards achieving a sustainable and socially viable society. SSB is a vehicle for multi-disciplinary professionals and their organisations to network, support one another, build partnerships, and to dialogue on the technical, social and practical aspects of sustainability. Major goals include the creation of a network of qualified change agents who will give presentations, forums and workshops to senior business leaders, as well as provide presentations, education and workshops to business. One of the initiatives has been to start a blog on Open Forum, titled 'Sustainability Insights'. This has begun by taking up the issue of how we are to reconcile diverse interests and plan from a high enough level to ensure that the steps we take towards sustainability really do address the concerns of the global environment, and not just those that are local, regional or factional. Prof. Ross Garnaut's report is not easy to listen to - takes full concentration - but it does face honestly the climate problem of our age and I personally feel proud of Australia making a contribution of this magnitude to global debate. Garnaut takes full account of the "No, let's wait until we're sure" lobby, as much as of the "Rush to fix" lobby. He makes it very clear indeed that we are working on probabilities, very strong probabilities (not certainties) but that with every year that passes, our options are reduced. He also makes a very good case for the economic well-being that can be found in well-planned change. You could say that climate change is forcing us to clean up the pollution of the Earth that we have been going along with for a couple of hundred years or much more. Changing our dirty habits will be a health benefit to us all and, it seems, an economic benefit. It was Picasso who said (a long time ago) "Man must learn to excrete again". The opposition ranges from those who continue to insist that we wait, to the Greens who think the report doesn't go far enough. 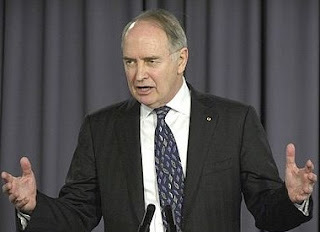 The case that Garnaut makes is for doing what we can as soon as we can. Any opposition to that? We should also congratulate Garnaut on the breadth of his thinking, something we don't always get from economists. And although his report uses the jargon of economics rather heavily, when he answers questions he comes across as very honest and human. Another plus!